Two of the most enticing reasons to take a cruise vacation are the unique entertainment and seemingly never-ending supply of food. 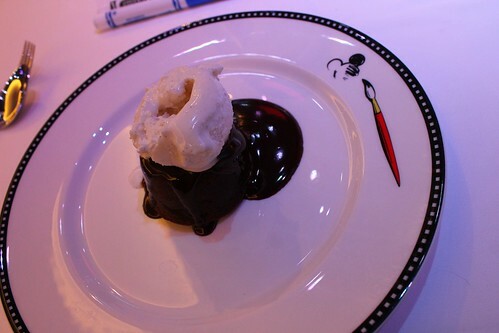 Across all four Disney Cruise Line ships, Disney has combined these two elements in its Animator’s Palate restaurant, offering delightful entertainment based on its rich film history over dinner. On the Disney Fantasy, the newest and most dazzling show to be featured in Animator’s Palate is called “Animation Magic,” bringing patron’s drawings to life alongside familiar Disney characters. 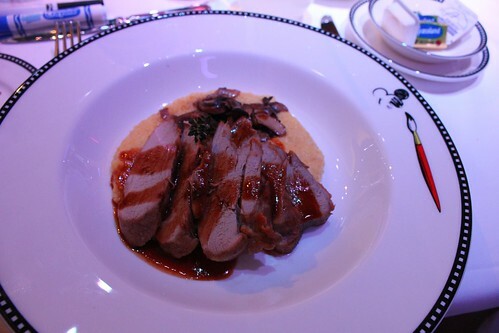 During the ship’s recent Inaugural preview cruise, the new show sparked laughter, amazement, and applause from the whole restaurant, but just barely made up for its lackluster food offerings. 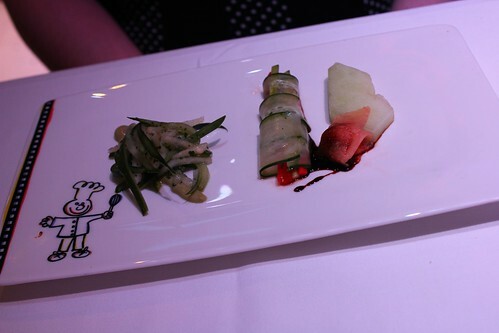 So let’s start with the good about dining at Animator’s Palate. With each new show that Disney debuts, Imagineers continue to impress guests with “how do they do that” moments. The entirety of the Animation Magic show is one of those moments, captured in the video below. 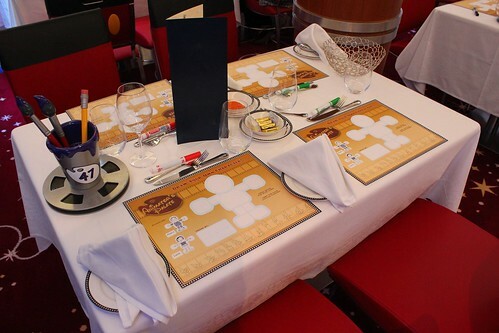 The experience begins as diners sit down, finding markers and blank sheets to drawn on at each place setting. Animation sketches are displayed on the restaurant’s many video screens, acting as inspiration for the soon-to-be-artists dining there. 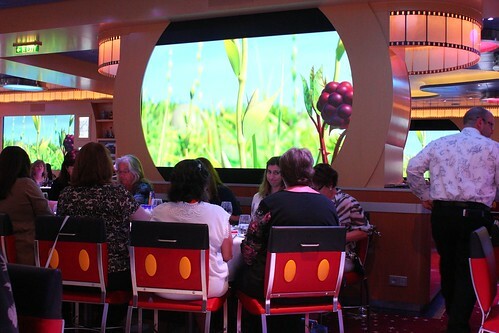 Over dinner, the show remains mostly out of the way, with scenes from various Disney animated films appearing on the video screens in the background. Mickey Mouse pops in at one point between courses to let everyone know that he’s working on a special show as a finale to the meal. It’s a nice change from Turtle Talk being presented in the same restaurant on the Disney Dream, where Crush invades and disturbs mealtime. 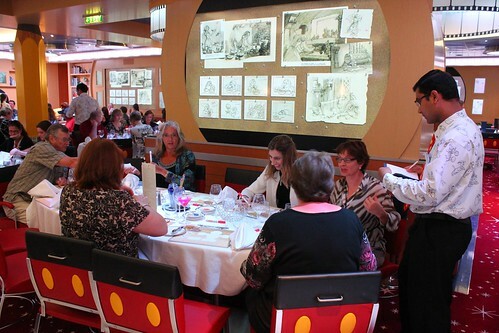 After cycling through the entire restaurant’s art, which takes several minutes, the grand finale incorporates a handful of selected character drawings to join Mickey Mouse, the Genie, Jiminy Cricket, Cinderella, and many other Disney characters in instantly-recognizable scenes from classic animated films. It’s the most magical moment of the show, marred only with the slight disappointment that not everyone gets a chance to see their own drawing interact side-by-side with Disney notables. But the entertainment value of seeing the drawings hold hands, dance, and otherwise frolic in high-energy scenes set to upbeat music far exceeds any mild disappointment. In the end, everyone leaves the unique show smiling. Unfortunately the dinner that was served to me and my wife Michelle was not nearly as exciting as the show that followed. Animator’s Palate features a few different menus and on this first night of the cruise, we were given the Pacific Rim menu, which I came to find out is inferior to the Captain’s Gala menu served the following night. 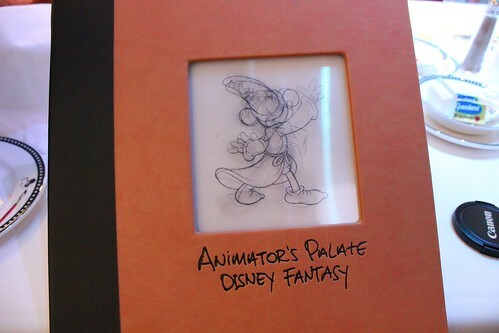 The menu itself is injected with a bit of fun, featuring a lenticular sketch of Sorcerer Mickey on the cover. The only item I thoroughly enjoyed eating at this meal was sitting on the table when I arrived. Strikingly bright in color, intended to resemble paint to go with the restaurant’s theme, the red pepper puree was delicious when spread on soft, warm bread. It’s not a spicy red pepper, but rather the flavor of a savory roasted red pepper, common to Italian cuisine. Not everyone at my table of 5 was a fan of the strong-tasting puree, but I devoured it consistently throughout the night in an attempt to satiate my appetite, which was most definitely not fulfilled by the courses that followed. 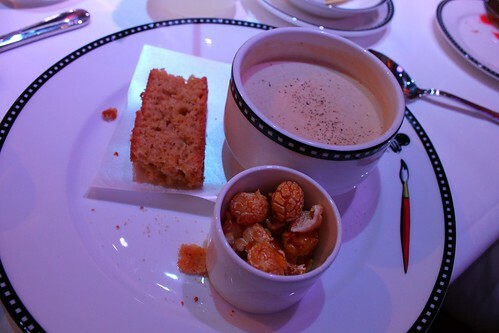 Appetizer options are consistent across all menus at Animator’s Palate, so no matter which night it’s attended, diners are given a seafood salad option or a corn trio soup option. As neither Michelle nor I enjoy seafood, I opted for the soup and she requested a vegetarian version of the salad, though she’s not a vegetarian. The corn trio consists of buttered popcorn soup, cornbread, and caramelized popcorn in a cup. To my taste buds, the soup was inedible, reminding me of the pungent flavor of artificially-flavored Jelly Belly jelly beans that are meant to taste like popcorn but don’t quite hit the mark. The individual popcorn pieces seemed like they had been sitting around for a while, as they were stale and soggy. And the cornbread was dry and fell apart far too easily. A dud all around. Michelle’s salad was slightly more interesting, with julienned pickled cucumbers the most flavorful. Though the appetizer course was not great, the entrees fared far worse. The Pacific Rim menu is dominated largely by seafood. At our table, two orders of tuna were enjoyed and one lobster dish was deemed overcooked. But for us landlubbers, the meal was far from a success. I probably should have known to not expect much when I saw meals being wheeled out on treys, covered and stacked in airplane-style containers. My pork tenderloin was bland and dry, assisted only marginally by the mushroom sauce poured over it. Unfortunately the mushrooms themselves tasted as if they were straight out of a can. And the cheesy polenta underneath was far more cheese than polenta and slightly gummy in texture. Michelle ordered off the “light” menu, not because she was health-conscious, but because aside from the pork, the only other non-seafood options were venison, of which she is not a fan, and parmesan-crusted chicken over fettucini – but we were due to have Italian food at Palo the following night. So she chose a sirloin steak, unbeknownst to her that “light” meant completely free of seasoning and flavor. The extremely thin steak was overcooked, with no salt, pepper, or any other herbs or spices used to help it out. It was accompanied by equally bland vegetables and an ordinary baked potato. Dessert proved to be only slightly better, with both Michelle and I enjoying, but not raving about, the chocolate lava cake. It wasn’t nearly as decadent as it appears in the photo below. Out of the five people at our table, only two were happy with their dinners. Talking to others who had dined at Animator’s Palate that night, the fettucini dish was apparently equally bad. Favorite items from the same restaurant’s menu on the Dream were missing, including the often-enjoyed Black Truffle Pasta Purseittes. Apparently these better options are served only with the Captain’s Gala menu, which we were not given, though our server did tell us he prefers it after dinner ended. He also wondered why I didn’t ask for a different entree if I didn’t enjoy mine, to which I let him know that I would have had I ever seen him during the meal. He showed up only at the beginning and end, neglecting to ever check on us. 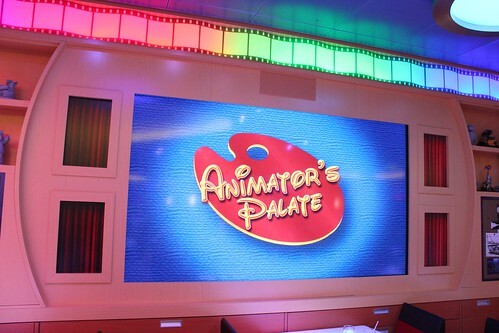 Ultimately the experience of dining at Animator’s Palate on the Disney Fantasy proved to be the exact opposite that I had on the Dream last year. I found Turtle Talk with Crush on the Dream to be intrusive while trying to enjoy what was a tasty meal. But on the Fantasy, I thoroughly enjoyed the Animation Magic show and wished the food would have been just as good as the entertainment. 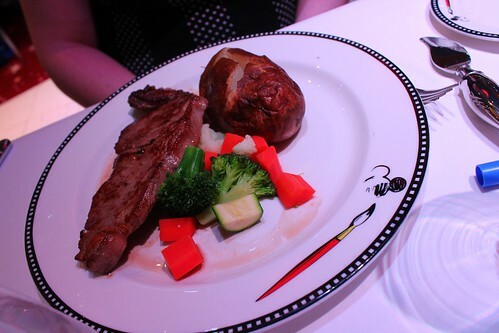 Not everyone had a poor experience with the food at Animator’s Palate, with seafood options better for those who enjoy that type of cuisine and a superior menu served on other nights. But as it was served to me, I expected a much more enjoyable meal during such a uniquely impressive dinner show. haha, this headline is pretty awesome. Awesome pics and review, Ricky!!! I’m sorry to hear about the food here. 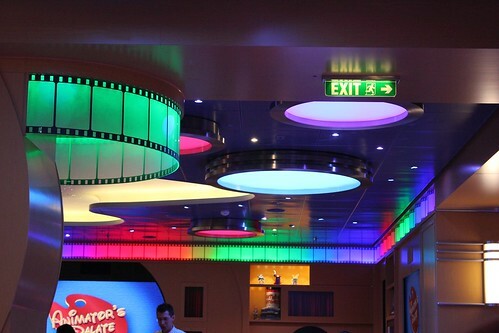 I really enjoyed Animator’s Palate on the Dream, but perhaps that was more about atmosphere and fun than about food. I maintain that Palo and Remy are the places to eat on the ship. How will you know if you’re getting the Captain’s Gala menu? I don’t think I understood how you got this menu. Does the menu differ night by night, or does one night’s menu have different options than the other nights? Thanks for the review! The daily Navigator guide that’s delivered to staterooms tells which menu is served that night. The whole restaurant gets the same menu. You may be able to find out in advance when you first get on board and change your dining rotation around then, though there isn’t always room to switch. Looks like we sat at the same table! What were the names of your dinner staff? Thanks for this review. One question…I have been talking up the Crush interaction that we experienced on Dream. 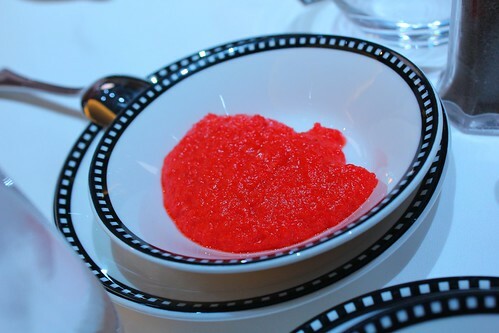 Is this still a part of dinner at Animator’s Palate at all? Did you go on a 7-day cruise? 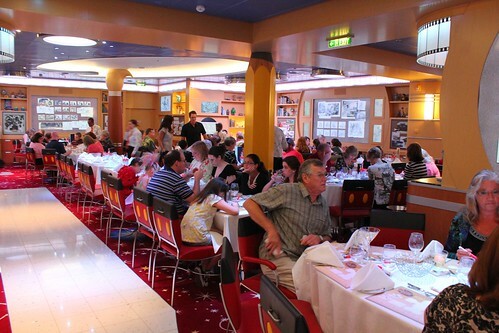 Do you know what the show is at Animator’s Palate on those cruises, when you eat twice in this restaurant? Thanks! Turtle Talk is indeed also part of the restaurant’s experience, just not on the same night as Animation Magic. Ok HARSH. I just got off the Disney Fantasy and found out that the sailing I was on was only the 9th! They haven’t had much time to refine the menu and waiters like the other 3 ships have. Granted, my head waiter sucked too. But give em a break sheesh! Not harsh. The menu is nearly identical to the one served on the Dream. There has been plenty of time to refine it before porting it to the Fantasy. Yes, the staff has to be trained, and I give them some slack for that. But I can’t write an honest review and chalk up all poor experiences to it simply being “new.” Everyone on the ship today is a paying customer and should expect a quality meal and service. Anything short of that is worth noting, now or later. I am a tubal shock at your reviews Out table that consisted of seven people found the advice and food amazing The pop corn soup was designed for you to put popcorn in to the soup to highten taste which without it would be like a chocolate Sunday without the chocolate. Our expience with the different menue was nothing short of amazing. So I might say you werea bit harsh as well.